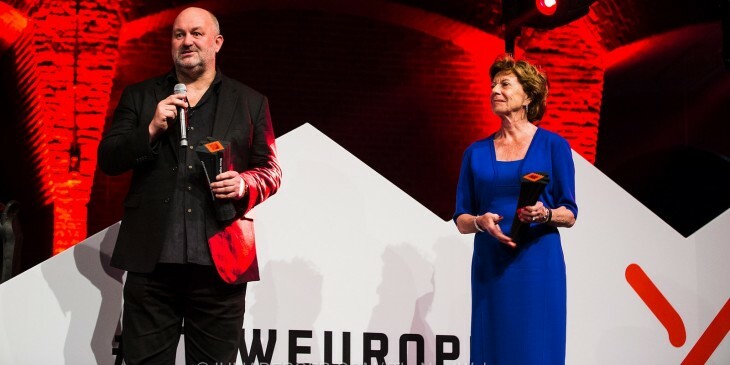 The Next Web’s Europe Conference kicked off today in Amsterdam, starting with Amazon CTO Werner Vogels and The Netherlands’ Special Startup Envoy Neelie Kroes being honored at the event. The Next Web’s first annual Technology Lifetime Achievement Awards were conferred on Vogels and Kroes for their contributions to the industry in The Netherlands by Amsterdam’s Deputy Mayor Kajsa Ollongren. Vogels has been responsible for realizing Amazon’s vision of delivering innovative products and services to its customers across the globe. His background in computer science research informs his ability to bring academic work into the technology industry at scale. After an illustrious career serving on the boards of commissioners at several multinational corporations, Kroes took up an active role as the European Commissioner for Competition for the Barroso Commission from 2004 through 2010. She is also regarded as one of the world’s top antitrust regulators. Kroes is now the Special Startup Envoy of the Netherlands, and is committed to enabling increased connectivity, mobility and innovation for upcoming businesses in the country. Congratulations to Vogels and Kroes for their outstanding achievements!